Yoga is an amazing practice with so many benefits, often unique for each individual. For me, its a wonderful decompressor, and it awakens my whole mind and body. While visiting my in-laws in Delray Beach, Florida, I was on a mission to find a great class(s) to participate in while there. I was told by the country club instructor to check out Keith Fox of Yoga Fox. Its was an amazing experience, with a ton of energy, and unlike any other yoga class I had been to before, especially the Sunday Yoga with live music. I highly recommend attending his classes if you are in the Delray Beach, West Palm Beach, or Fort Lauderdale area. I am debating on going on his yoga retreat in Costa Rica, but that's a whole other story! As a yogi since 1998, I try to practice every day #yogaeverydamnday. 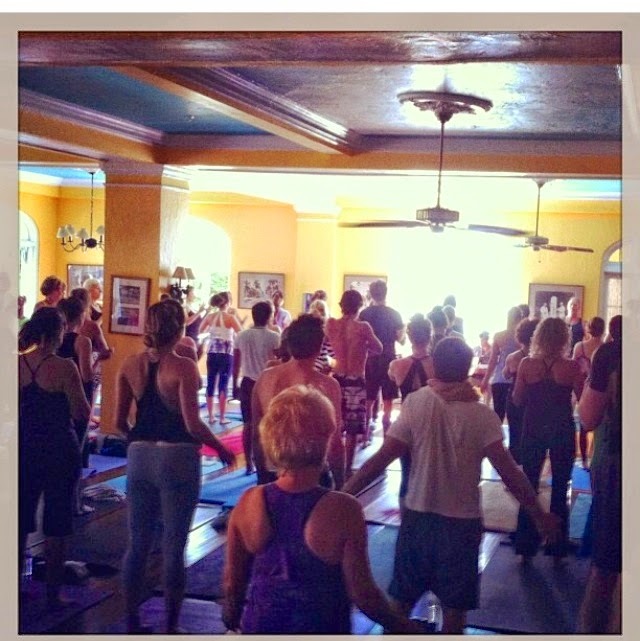 Can you find me practicing in this picture from Keithyogafox's instagram?? Keith Fox developed YogaFox Vinyasa based on his years of study in the Ashtanga and Vinyasa “limb” of the Family Tree of Hatha Yoga. Keith is well known in South Florida for his Yoga with Live Music class which welcomes over 100 students each Sunday from 9:30-11am at The Colony Hotel in Delray Beach, Florida. Keith also shares his Yoga with Live Music at local Workshops, Retreats, and at National Festivals such as Wanderlust and YogaFest. His classes always includes the classic YogaFox Vinyasa Flow as well as an amazing Yoga Nidra Meditation to close the class. Keith plays harmonium and shares his devotion at each class as well. The system developed by Keith Fox incorporates many asanas from the first, second, and third series of Ashtanga Yoga (as shared by Pattabi Jois) as well as a variety of other asanas. Keith’s partner, Kelly Brookbank Fox, brings experience from the Kripalu school of yoga which enables the YogaFox Vinyasa school to incorporate advanced pranayama and meditation in motion into the flow. Further, Keith and Kelly both share their love of Kali Natha Yoga (as taught by Guru Ma Jaya Sati Bhagavati) in their teachings. This combination of the physical asana along with the meditative practices of yoga allows the YogaFox Studios and school to offer a comprehensive yoga experience for all participants. Keith also incorporates Bhakti Yoga and Nada Yoga (devotion and healing sound qualities) with his sharing of music at all of his classes through singing and kirtan. YogaFox studios has two studios in Delray Beach Florida and offers 38+ classes per week. Most instructors are trained by YogaFox school of Yoga and share components of the training described above. The YogaFox school is registered with the Yoga Alliance as both a 200 hour and 500 hour program. Vinyasa yoga links postures together with the breath in a dance like rhythm. This was first introduced with the Ashtanga yoga practice about 110 years ago by Sri. T Krishnamacharya and was taught to his disciple, Sri. K. Pattabhi Jois. This original form of Vinyasa followed a specific series of postures in a certain order. Once the first level was mastered, known as the primary series or first series, a student would then move on to the second and third series. It was the Guru’s job to guide the progress of the student. Keith’s Vinyasa style incorporates the first three series of the Ashtanga system. The sequencing of these asanas is safely designed to build core strength, lengthen the musculature, and open the heart. The combination of postures provides a place for each student to empower themselves and achieve inner peace. In a typical 90 minute dynamic vinyasa class with Keith each student is challenged yet not discouraged, keeping it fun regardless of the student’s level. The classes help eliminate stress for students as well as lighten their practice by strengthening the core and developing more of the subtle muscles rather than the larger gross muscles. The goal is to maintain a smooth and even heated breath. Keith’s intention is to provide a spiritual approach about the heart-opening light entering the soul. Whatever the reason you find yoga, and whatever style you find, experiment and eventually you will find the place which fills your heart and your soul and at that time…Yoga will have found you. Namaste! A deepening of the inner awareness which leads one towards a greater appreciation of one’s own spirituality Maybe you will simply enjoy the relaxation, or like taking a rest from your busy life, or enjoy working hard on yourself, or you may simply like the toning and stretches within the practice. Is Yoga a religion? The plain and simple answer is “No”. Yoga is compatible with whatever religion you practice or also if you do not have a religion. If one is religious and spiritual, then Yoga should help deepen one’s own religious beliefs as it provides clearer insights into spiritual states that arise from within. However, if you are not religious in any way, Yoga does not force you to believe in any particular belief. You simply follow the Yoga practices and allow yourself to appreciate whatever benefits that you experience for yourself. The origin of Yoga lies hidden in the mists of prehistory. It slowly evolved and developed by the ancient sages, not only in India but also all over the world. Generally the techniques of Yoga were passed on from teacher or guru to their disciples by word of mouth. Some of the earliest written texts which mention Yoga and allude to its practice were the ancient Vedas which are approximately 4000 years old. More direct descriptions were later written down by the Yogi Patanjali and are often mentioned as the oldest written record of Yoga. These ancient texts are approx 2000 years old. The Yoga which we see today in the West generally originated from India and came to the Western world over the past 100 years. There are now various schools of Yoga which are available. These types of Yoga have evolved from teacher to student so that each Yogi has added their own flavor to the ancient practices. Some begin with quite strong postures while others begin very gently and gradually get stronger with the pace and ability of the person learning. There are many different styles of Yoga nowadays, and each class may be quite different. Some basic descriptions might help you decide. Vinyasa: Strength and flexibility in a physical flow combined with breathing techniques. Basic Hatha Yoga: Lying down and relaxing, standing up and stretching, tuning inwards with awareness, breathing slowly and mindfully. Kripalu: Deep stretching and physical awareness, relaxation using breath and eventually “Meditation in Motion” for the yogi. How does one start to practice yoga? One starts usually by attending a Yoga class. This is much more advisable than buying a book and practicing oneself. Having the hands on instruction of a certified teacher can help a student align the postures correctly and prevent injury. Once the confidence and body awareness arises from a yoga class, the practice can be enhanced with books or videos. However you decide to start, have fun and enjoy the journey! The detachable collar was a quiet, subtle assassin. By cutting off circulation, it could creep up on a man in his drunken sleep and choke him to death when the man's head fell forward. It could also just by being tight, or in cases of indigestion that lead to the neck swelling it would simply strangle its prey. Curry finally became a starter this season, march for science t shirt playing a career high 56 percent of the defensive snaps. Yet Curry's role is considerably different than it was earlier in his career. Curry's primary responsibilities are on early downs, and funny running shirts he comes off the field in some passing kodak black shirts situations.